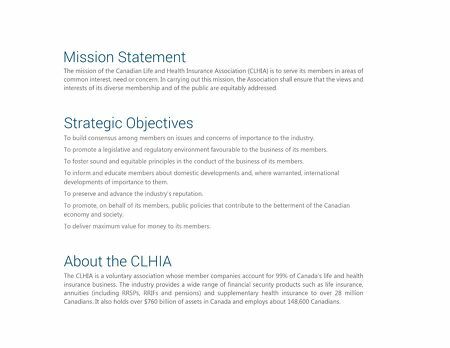 Mission Statement The mission of the Canadian Life and Health Insurance Association (CLHIA) is to serve its members in areas of common interest, need or concern. In carrying out this mission, the Association shall ensure that the views and interests of its diverse membership and of the public are equitably addressed. Strategic Objectives To build consensus among members on issues and concerns of importance to the industry. To promote a legislative and regulatory environment favourable to the business of its members. To foster sound and equitable principles in the conduct of the business of its members. To inform and educate members about domestic developments and, where warranted, international developments of importance to them. To preserve and advance the industry's reputation. To promote, on behalf of its members, public policies that contribute to the betterment of the Canadian economy and society. To deliver maximum value for money to its members. About the CLHIA The CLHIA is a voluntary association whose member companies account for 99% of Canada's life and health insurance business. The industry provides a wide range of financial security products such as life insurance, annuities (including RRSPs, RRIFs and pensions) and supplementary health insurance to over 28 million Canadians. It also holds over $760 billion of assets in Canada and employs about 148,600 Canadians.